If you are interested in acquiring one of the wonderful vintage versions of the original Spirograph, then your best bet would be to find one used on a website such as eBay. PLEASE NOTE: We are making every attempt to keep this Spirograph resources list current. 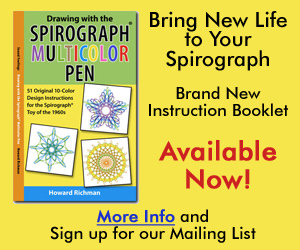 If you come upon a spiral drawing tool that you think should be included here, please let us know about it! NOTE: We do not sell the units below. We just think they are cool and wanted to list them. If you want to purchase any of the units below, please click on the links associated with each one and you will be taken to the respective websites where you may purchase them. Cycloidal Scribbling-Engine $35.00 US. This is exactly like the Original Spirograph toy you remember, only bigger, MUCH higher quality, and with more options. The teeth on the gears are proportionately much deeper than on the original Spriograph. This helps prevent slipping and makes it easier to draw smoothly. Each plate is cut from 3mm clear acrylic, is 7" (18cm) across, and includes a variety of rings and gears in several sizes. 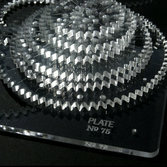 The individual plates work as self -contained sets, or they can be combined with each other to make an ever-increasing number of different patterns. You'll need to provide your own pins, baseboard, and pens. Hypotrochoid Art Set Imagine a fixed point set inside one circle that travels along the inside of a second circle. The complex harmony of the position of the point, and the diameters of the two circles create a complex looping track. It’s beautiful, but it’s math! 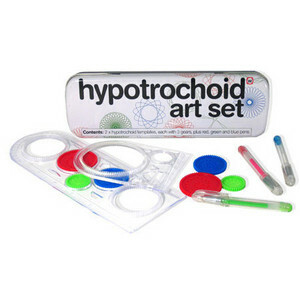 Included in the Hypotrochoid art set are: Two Hypotrochoid templates (outer circles) Six gear circles (inner circles) Red Green and Blue Pens Convenient metal traveling tin. Klutz’ The Spiral Draw Book Winner of the National Parenting Center Seal of Approval. Spin and swirl these colorful gel pens – and see what magic you create. With everything you need to create "a zillion" zany, colorful and crazy designs! Includes Four drawing wheels, Three gel pens, 55-page, spiral-bound drawing book, 2 month manufacturer's warranty. Quercetti’s Spirogiro Mandala Patterns by turning the various gears inside the central board - Includes 6 gears, 1 template, 12 markers, 12 sheets and a manual. Hasbro’sDeluxe Spirograph This is the product that I was excited to share with my son. I was hoping that it was even BETTER than the one form the 1960s and you would think by its name that that would be the case. But unfortunately, this product is pretty lame compared to the original. I think it is because they had to get rid of all the tiny little parts due to lawsuits, and what is left is very limited. 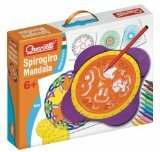 2 in 1 Mandala Designer Classic by Ravensburger Create hundreds of different Mandala designs. Colored pencils & paper included. At the touch of a button the stencil moves forwards or backwards, enabling children to create designs without the paper slipping. In combination with stamps & coloring, children can create an endless amount of beautiful designs. All the components store neatly in the case so that children can take their Mandala Designer wherever they go. Set the parameters and watch with amazement how these online Spirographs will draw your intricate spirals all by themselves. Most of them are free Spirographs. VERY cool. Drawing with the Spirograph® Multicolor Pen: 51 Original 10-Color Design Instructions for the Spirograph Toy of the 1960s. Spirograph pens kit includes red, blue, green and black ink. Original Spirograph Pen Refills with black, blue, red and green ink. These have the old-fashioned narrow tips that are required to fit through the Spirograph gears. You will be interested in our multicolor pens. Write 10 colors with one pen! These pens are a perfect low-cost alternative to replacing your original Spirograph pens. Bring more creativity by adding additional colors to your Spirograph experience. The ballpoint tips of each of the cartridges inside are the exact right size to fit properly into the holes of the Spirograph gears. Colors include black, blue, red and green, yellow, light blue, pink, purple, brown, and orange.